Life is too short for gluten-free food to be dull. So, the founder of no.1 free-from brand, Genius gluten-free, Lucinda Bruce-Gardyne, shows us lots of tasty ways to keep it interesting. On the menu are: Tasty tarts and pies, soups and salads, and pasta and pizzas; breakfast treats like American Pancakes and French Toast; nutritious family favourites from Chicken Pie to Lasagne and Savoury Crepes, and inspiring ideas for entertaining, including Cheese and Rosemary Sables and Tarte Tatin. 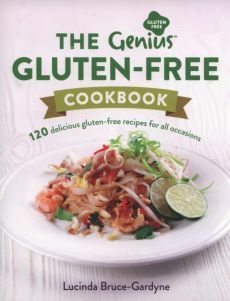 Packed with tips, advice and knowledge gleaned from years of exhaustive research and experience – from how to read food labels, the science behind ingredients, the benefits of a gluten-free diet, and the essential gluten-free store cupboard ingredients explained – Lucinda creates great-tasting food every time. With recipes well within the range of cooks of all abilities, this book adds up to an indispensable family cookbook. As more and more of us are looking for inspiring gluten-free and coeliac-friendly recipes, trained chef, Lucinda, brings together 120 tried-and-tested recipes in this accessible and beautiful cookbook.